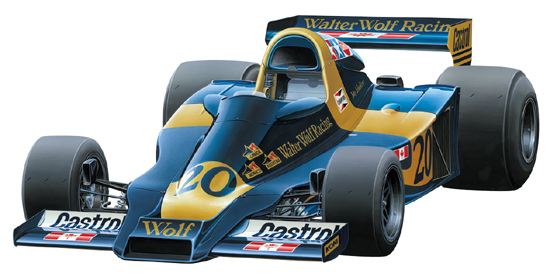 TAMIYA 12044 WOLF WR1 1977 (1/12) scale model kit! • 1/12 scale plastic assembly kit of the Wolf WR1. • Length: 349mm, Width: 164mm, Height: 79mm. • Coil springs are used to mimic the movement of the front and rear suspension. • Steering wheel moves front wheels via rack and pinion system. • The DFV engine, including the fuel pipes, ignition cords, etc. has been accurately reproduced. • Front and cockpit fairings are detachable to show-case the internal mechanisms.-Photo-etched parts are included for various details and seatbelts for a realistic interior. • High-quality Cartograf decals to depict the car from the 1977 Japan GP included.